Bow's village water supply came about as a result of the generosity of William Packer of Bow (1783 -1856). He was born and died in the village, was a tanner and latterly a farmer. In his will dated 25 August 1855, he bequeathed £400 to be used to construct waterworks to supply the town of Bow. Five villagers were appointed as trustees: James Lee Sanders, John Partridge, John Heard, John Bibbings and James Sanders. In 1858, they bought part of a field (called The Orchard) owned by John Wreford (1794-1861) of Serston (Zeal Monachorum) for £60. This was the site for the reservoir. A further £200 had been donated by Mrs Selina Wreford (formerly of Clannaborough). Pipe works and standpipes were then installed in the village. Bow Waterworks was opened in April 1859. Use of the village standpipe taps was free of charge; private houses were supplied for 5s for the first tap and 2s 6d for any other. In 1907 the waterworks became regulated by a scheme of the Charity Commissioners by Bow Parish Council. By 1911 the charity had an annual income of about £15 10s from house owners, which covered maintenance costs. 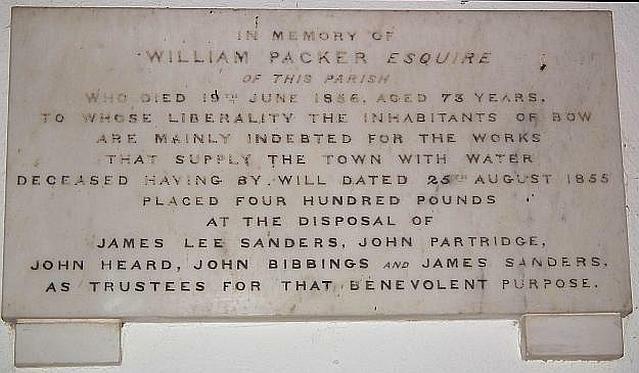 There is a plaque in Bow Church commemorating William Packer's good deed. He had no family of his own and left the residue of his estate to various cousins. As an afterthought he added a codicil to his will on the same day it was written, leaving £50 to William Warren, surgeon of Bow. The newspaper report of Packer's death said that he died after a painful illness, but that his memory would be long cherished by all who knew him, and the inhabitants of Bow village would long have occasion to remember his kindness during a life of 72 years. Bow Waterworks continues to supply many houses in the village.